Back to Fundamental LA, this time for something new to the menu. Gone is the short rib sandwich, and in its place is braised lamb with eggplant, arugula pesto, roasted red peppers and pickled red onion on grilled sourdough. Compared head to head the short rib is a bit more adventurous, but there are things here to enjoy. 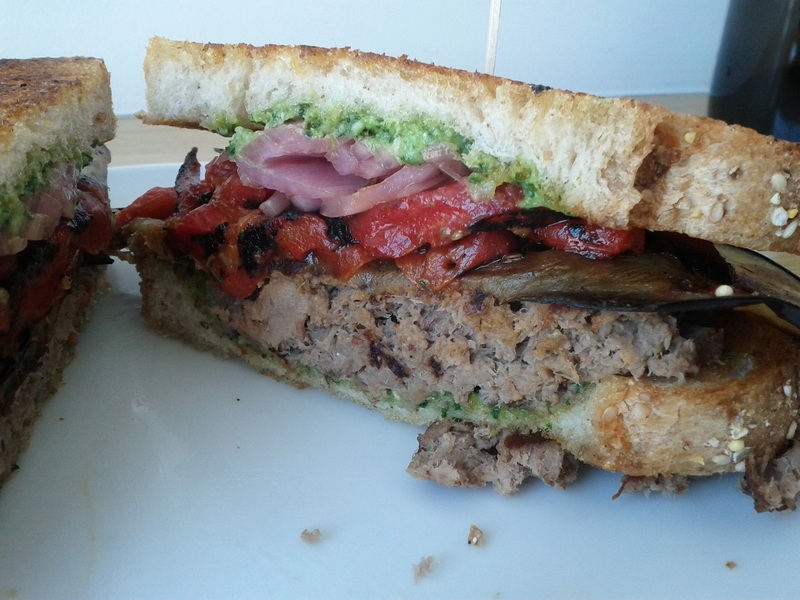 The pesto went down on both the top and bottom of the sandwich, preventing the flavor from being lost. Overall the flavors work well together, and pickled red onion with roasted red peppers is a pairing that doesn’t show up often enough. It wasn’t without its issues. Given that the eggplant was given second billing I expected quite a bit more of it, but it’s just a few slim slices, much to the sandwich’s detriment. The lamb was a touch dry, but I imagine that’s something that varies from day to day. All in all, Fundamental LA keeps up the effort as one of the stronger places for lunch in or around Westwood, and the next time the menu gets something new I won’t hesitate to give it a go. This entry was posted in Sandwich Reviews and tagged Fundamental LA, Lamb, Los Angeles, Reviews by Pete, Westwood by Pete. Bookmark the permalink.